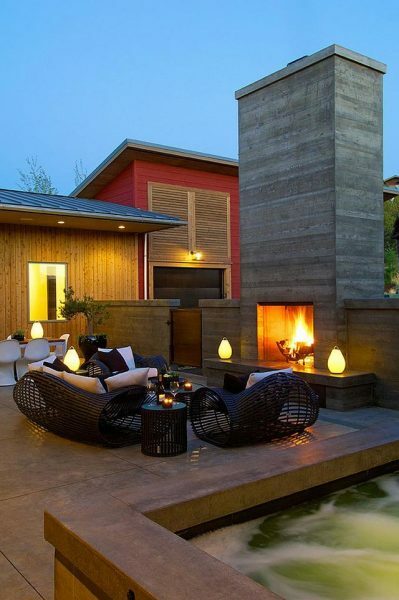 Adding a fireplace to any outdoor space not only expands the existing living space but also establishes a fabulous focal point. 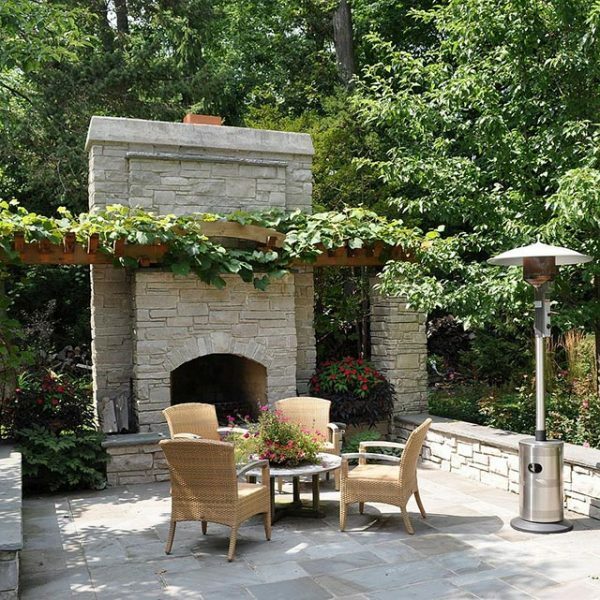 Whether traditional or modern, stone or brick, simple or elaborate, imposing or small, outdoor fireplaces are a gorgeous addition to any outdoor space. They offer functionality and appeal, add visual interest and personality, and make colder evening much more pleasant. They add warmth and charm and create a specific, unmistakable sense of romance and intimacy. When complemented by garden structures, dining spaces, seating arrangements, flower containers, area rugs, lights, lanterns, and candles, any space with a fireplace has definitely an enchanting look. However, creating such a fascinating outdoor spot needs some planning. Even if you might not be prepared to invest in an expansive patio living space all at once, plan it well in advance. As the fireplace is usually the focal point, make sure that you have enough space both for it and the surrounding décor, such as some seating space. Also, before planning an outdoor living space, consider the view on offer. Note that gas fireplaces are far more expensive than wood-burning counterparts. Also, a custom fireplace costs more compared to existing, freestanding models. 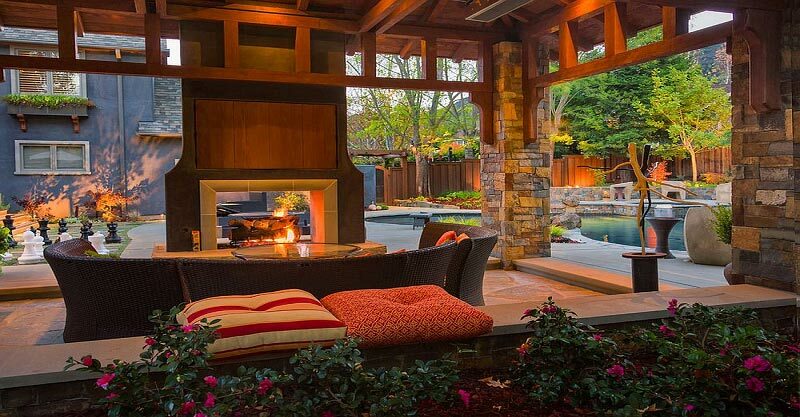 In this covered deck area, a wall-mounted fireplace is complemented by an elegant, comfortable seating arrangement and dining space. The mind-blowing view adds to the appeal of the space. Definitely a gorgeous retreat! Look at this breathtaking Mediterranean-style escape for two! After all, you do not need a lot of space to create a relaxing outdoor retreat. Unique old brick flooring in concentric circles contrasting the stucco façade adds extra visual interest and a lovely seating arrangement – functionality. Plenty of potted greenery, a lantern, and lovely accessories bring in color, charm, and personality. 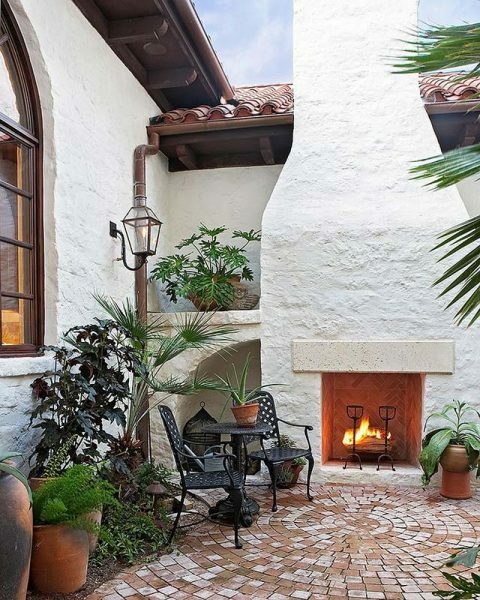 What actually immediately grabs the eye is the imposing fireplace, which definitely dominates this small courtyard. What’s not to love in this space? If the fireplace and the outdoor lounge are right next to the structure of the house, then you can opt for a style that matches the style of the home and turn the outdoor area into an extension of the interior. Just the opposite approach is to choose a completely contrasting style to create an exotic paradise in your own backyard. An absolutely breathtaking self-standing Spanish-style fireplace complemented by an elegant seating arrangement create a cozy outdoor room. 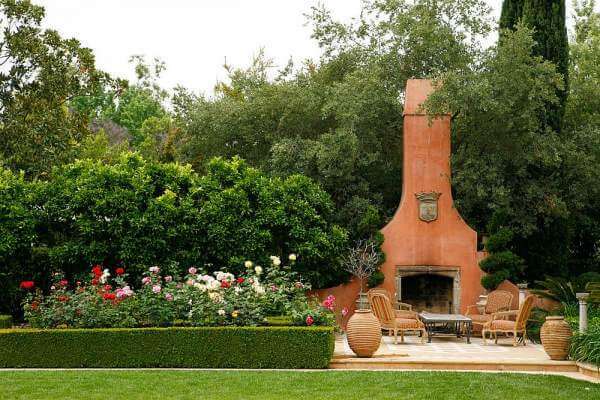 Topiaries flanking the fireplace add tons of visual interest and personality and roses surrounded by a boxwood hedge – color, scent, and charm. Lush greenery offers privacy and completes the look of this magnificent outdoor space. Consider adding some shade to enjoy your outdoor space all year long. Whether a covered patio with an alfresco dining zone, a lovely pergola draped in climbing vines, or a simple garden umbrella, you have plenty of options to choose from, it all depends on your budget and preference. A stunning stacked-stone fireplace complemented by a built-in pergola makes this traditional patio a dreamy space to spend time in. Lush greenery creates a living privacy wall. Potted flowers add color, scent, and extra visual interest. An elegant seating arrangement completes the look of this lovely spot where to relax or entertain. As for the surrounding décor, the best case scenario is to match the style of the fireplace with that of the furniture. With an array of options available on the market, completing the look of your outdoor space will not be a challenge. 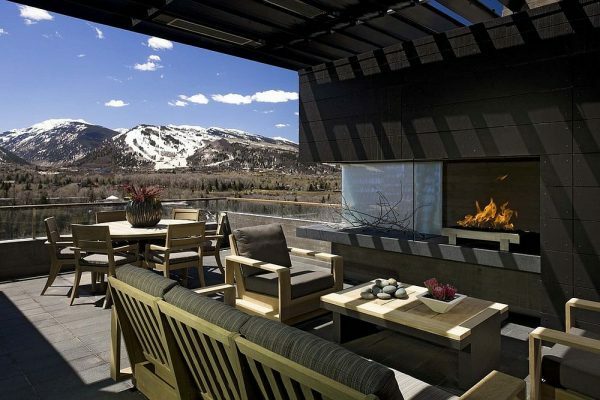 A contemporary fireplace creates a vertical focal point in this multi-functional patio. Modern wicker furniture definitely adds coziness, appeal, and an organic feel and makes a nice contrast to the straight lines of the fireplace. A Jacuzzi adds extra functionality and charm. Unique lights create a romantic ambiance. Potted plants bring in color and freshness. What a stunning contemporary hangout! 3. Think Beyond the Fireplace! However, if a fireplace does not work for you, then consider other options, such as fire pits, which are cheaper than most fireplaces. You can even combine fire and water to create a stunning poolside feature. 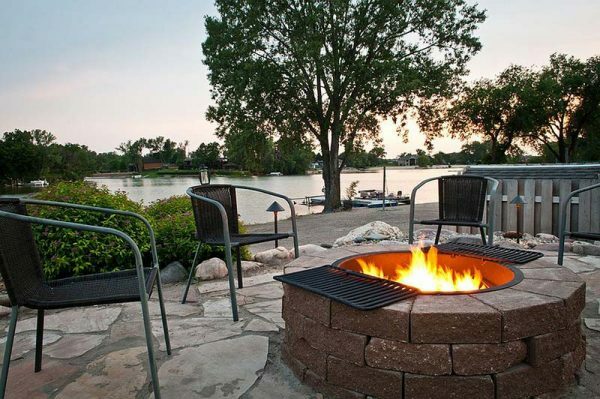 The gas fire pit in the above picture can be instantly converted to a large grill. A rock boundary adds extra visual interest to the contemporary flagstone area around the fire pit. Greenery adds to the appeal and charm of the space. Not to mention the magnificent view! So, get creative and explore all available options before making your final decision!